Ah, Crucial Brew. Happy memories. But this post isn’t about Crucial Brew, for reasons that will become apparent; it’s about the other high-strength speciality from Desnoes & Geddes, Dragon Stout. When Asda opened down the road, one of the first things I noticed was that they had a range of food aimed at the West Indian market – patties, jerk seasoning, Dragon Stout. The patties were good, but the Dragon Stout was extraordinary. Or so I remember thinking, several years ago. The other day I felt like trying it again. The thing is, memory is terribly untrustworthy when it comes to beer. I don’t think I’ll ever have anything like the Chimay White I had in a hotel bar in Dunkeld, the Franziskaner Weissbier I had in a German sausage shop in Barcelona or the Buckley’s bitter I had in Pembrokeshire when I was fifteen. I realise that the memory is very largely of the situation rather than the beer – if I could somehow be transported back to those scenes now I’d probably find the beer rather unremarkable. But those remembered tastes still live on in my memory, and still set the standard for what I expect from a beer. So I could say without any embarrassment that Spingo Middle was even better than Buckley’s, bearing in mind that when I talk about Buckley’s I’m talking about my memory of the best half of bitter I’d ever tasted, rather than what Buckley’s bitter was actually like – or, for that matter, that Marble Decadence was even better than Dragon Stout. Crucial Brew is interesting in this respect, because once again I’ve got a very clear and specific tasting memory. On the 4th of July 1987 (OK, I’ve googled this bit), Manchester City Council put on a free concert in the newly-pedestrianised Albert Square, to celebrate the fact that it had been pedestrianised. My partner and I wandered by and ended up staying all afternoon and well into the evening. I don’t remember who was on apart from the headliners, who were Wet Wet Wet. A bit MOR for our tastes, but they played a good set – and to be fair, this was a couple of years before “Love is all around”, a song I’ve always detested. (My older sister used to have the original single, by the Troggs, and played it to death. I think my dislike of fake American accents in pop music may go back to that record – it was years before I realised that it was supposed to be written on the wind, not “on the way in”. But I digress.) Since this was also some years before alcohol exclusion zones, I went down to Safeway and got some beer. It was a hot day and a pleasantly warm evening, and we got through several cans of something by McEwan’s which I’ve now forgotten – and two Crucial Brews. The strength of Special Brew with the mellowness of Red Stripe – I’d never drunk anything quite like it, and still haven’t. Information I’ve seen elsewhere suggests that Crucial Brew had a redesign some time after 1987, switching from the sensible-drinking 330 ml can I remember to a 440 or (yikes!) 484 ml. 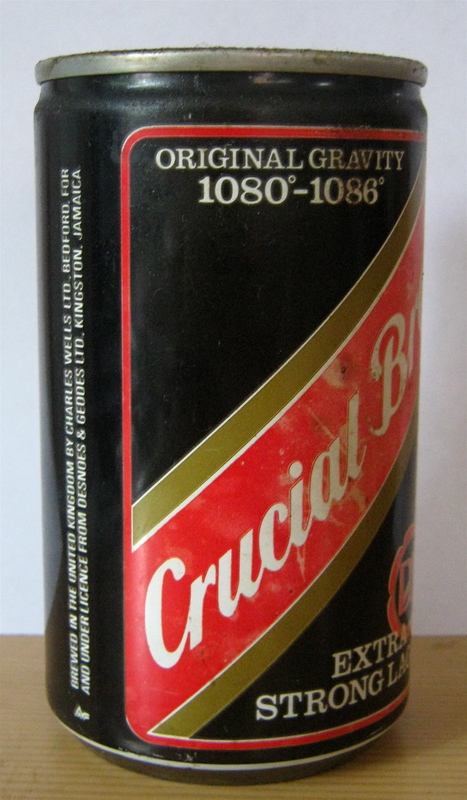 According to this page, Crucial Brew was still being brewed in the UK (presumably by Charles Wells) and shipped to Jamaica in 1994; according to this one the trademark was last registered in the US in 1998 and has now expired. So I think it’s an ex-beer – and, being realistic, it probably wasn’t really that much nicer than Special Brew, even back in 1987. It still holds the Very Strong But Surprisingly Mellow crown, at least in my head. Which brings me back to Dragon Stout (brewed in Jamaica, incidentally). I remembered this one as combining a velvety smoothness, an extraordinary richness and depth of flavour and a kind of depth-charge of alcohol, hitting you on the swallow. All in all, I was quite looking forward to trying it again. First impressions were bad: the aroma was malty, but with an odd sort of sour, metallic maltiness. Having checked the date on the bottle, I poured it and pressed on. Well, it was OK. Very sweet – no grain flavours to speak of, and the malt has to fight it out with caramel. Surprisingly light-tasting – not at all cloying, and didn’t leave me feeling I’d had a full meal as stouts sometimes do. No alcohol depth-charge, either (maybe I was thinking of the Crucial Brew) – if anything, Dragon doesn’t really drink its strength. Verdict: it was OK, but I don’t think I’ll be seeking it out again. But if you know of anything resembling Crucial Brew, or anything that can plausibly be compared with Crucial Brew, do let me know. Local #3, and probably the one of the four I visit least often, is the Hillary Step. Vital statistics: another small-ish house, like the Marble in consisting of a single through room with a mixture of large and small tables. I believe it’s formally a Thwaite’s house – certainly when it opened in 2004 they had not one but three Thwaite’s bitters, with red and green pump clips alongside the more familiar blue Bomber. (The red-clip bitter is now Original, although I vaguely remember it being labelled Best at the time. The green-clip bitter seems to have been discontinued, although since I can’t remember what it was called it’s hard to be certain. That was my favourite of the three, ironically.) These days one Thwaite’s beer (generally Wainwright’s) is joined by two guests, generally from the hoppier end of the northwestern scene (Phoenix, Pictish, Abbeydale). It’s like the other two in not having a kitchen for hot food; it’s unlike them both in serving food nevertheless, in the form of elaborate plates of nibbles and cheese platters. No TV, but there’s generally piped music, often quite loud and sometimes quite obscure; they also have live (amplified) acts fairly frequently. I have quite mixed feelings about the Hillary. To look at it’s rather lovely; the whole length of one wall is painted in deep colours with a scumbled effect, and finished with some sort of hard glaze. (I remember hearing at the time it opened that this technique was fearsomely expensive.) It’s a light and airy pub in the summer months; the beers, although not cheap, aren’t ridiculously expensive, and they’re generally well kept. And yet. Ever since the Hillary Step opened as a non-smoking pub, a few months ahead of the smoking ban, there’s been a sense that it’s not like those other pubs, or not like pubs in general. To put it another way, there’s something a bit unpublike about the place. It’s a bit too light and airy (and too well-lit in the evening); the piped music’s a bit too loud; the food’s a bit too expensive – and you can go for quite a long time without hearing a local accent in there. (Perhaps needless to say, I’ve never seen any trouble in there – although there was a drive-by shouting once ((c) Nigel Blackwell).) Sometimes it feels less like a pub, more like a wine-bar that happens to serve cask beer. From my point of view as a frequently-solitary drinker, it would be a great place to sit and take root and get quietly drunk, but it’s not so good for relaxing for half an hour over a pint or two. Still, they seem to be doing pretty much OK; last Saturday at 6.00 there were about 25 in, which is respectable if not mad busy. They’re just acquired some competition: a thing called “Nip and Tipple” has opened next door, offering a full cooked menu, a TV tuned to X Factor of a Saturday evening and no cask beer. It’ll be interesting to see how the management respond – hopefully they’ll do the sensible thing and accentuate all the ways in which the Hillary is different from this rather unappealing offering. About three years ago, a friend of mine started a monthly folksong singaround. This proved popular and went fortnightly. It also spawned an instrumental session, which started out monthly but has recently also gone fortnightly. So once a week, mid-week, I go to local 2 – the Beech. I described the Marble Beerhouse as small; the Beech is just as small if not slightly smaller. In terms of actual floorspace it’s probably larger than the Marble, but it has an old-school floorplan which means that not all the space is available. Specifically, what you get at the Beech is a big square back room, brightly lit and essentially a public bar or vault; a rather formless area without much seating, between the front bar and the door, which would be great for after-work bar-propping but takes a lot of filling at night; and a snug. Yea, verily, a snug (is this the last one in Manchester?). It’s the snug where the assembled folkies meet, and we almost always fill it – which takes 20-25 people, give or take (any more than 25 and it really would be snug in there). I suppose the total capacity of the pub would be around 50-60 sitting down – or 40-50 sitting down and breathing out – plus as many standing up as you could squeeze in. Until recently the question of maximum capacity has been strictly theoretical. I would say that the Beech has had its ups and downs, but until recently there haven’t been that many ups. When the folk events started I hadn’t been in the pub for a few years, and I was shocked at how it had gone downhill. The decor was tatty, and we took to bringing candles with us after the lighting cut out on us one evening, but those problems would have been trivial – or even added to the charm of the place – if the pub had been doing well. It wasn’t. There might have been 25 people in the snug, but in the other two rooms you’d only see a handful of people throughout an evening. The few regular clients the pub did have tended to be lively, to put it politely; we were insulated from it all in the snug, but on a couple of occasions we could hear a row escalating and turning into a fight. (We just kept playing.) The state of the beer – and the ever-shrinking ratio of functioning to dead handpumps – became a standing joke, although it went a bit sour (literally) the night we turned up and all the cask beers were off. I think there’s a level of regular custom below which a pub can’t function – a kind of event horizon; get below that point and the beer starts going stale, the management starts turning a blind eye to troublemakers (they’re putting money over the bar, after all), and staff start leaving and being replaced by demotivated part-timers. I’ve seen the Beech slip into this kind of vicious circle, which can only end in closure, not once but twice – one new licensee came and went within a year. Happily the new new licensees seem to be keeping the pub in orbit, as it were. Tonight there were no fewer than four bitters on; the two I tried (Black Sheep and Copper Dragon Golden Pippin) were in fine condition and reasonably priced. Not only that, but there were at least as many outside the snug as there were in it – all in all, between the snug (which was still packed), the other two rooms and the smoking area out the front, I should think there were at least 50 people in the pub when I left at 10.30. This is not bad for a weeknight, especially for a pub with three competitors within a couple of minutes’ walk. Verdict: I think perhaps this time it’s going to be all right. The new licensees deserve a great deal of credit for this hopeful state of affairs. Where the Marble had years to establish itself and build a regular clientele, the Beech has had to start from scratch and build quickly: the pub is an Enterprise Inns house, and Enterprise are notoriously exacting when it comes to shifting units. (If it fails again (perish the thought), the fault will surely be with Enterprise rather than with anything the licensees have done.) The licensees have been particularly assiduous in setting up regular events – it’s actually partly down to them that our folk sessions have gone weekly – and I assume that the core clientele which the pub is now building up is being built partly on the back of the audience for different events. Good plan: not so much “build it and they will come” as “get them in the door, then sell them decent beer and then they will come (back)”. Works for me. I’ve been reading a lot of gloomy reflections on the decline of the pub lately, thanks to bloggers like the Curmudgeon. In that light I thought it might be interesting to take a look at the four pubs where I drink regularly (by which I mean at least once a month). NB I don’t get out a lot in the week (with the exception of visits to local 2 – watch this space) so reports of pubs packed to the gunwales should not be taken as indicative of what goes on 85% of the time. Local 1 is the Marble Beerhouse. It’s a small pub with a mixture of wood and plush seating; it seats about 50, with standing room for another 20 maximum and a forecourt that’ll accommodate 10-15 more people. Most weeks when I go in there are four or five Marble beers on, plus two guest ales and a real cider or perry (good, but annoyingly kept in the fridge – if I’m drinking something from Biddenden’s or Gwynt y Ddraig I’d prefer to be able to taste it). The beers are well-kept and not overpriced – prices are creeping up here as they are everywhere else, but the £3 price tag is still a relative rarity, reserved for strong ales and specials. They serve bar snacks (Kettle Chips, bombay mix) but no food. There’s a small TV in one corner, which is only on for big matches, and no music. The staff are friendly and efficient, and staff turnover seems pretty low; the other side of the bar seems like a friendly place to be, as far as you can tell, and it’s stayed that way through two changes of licensee. It gets busy. Years ago some friends and I tried to get a folk music session going around a table at the back, but the general level of conversation was so high that we couldn’t hear what we were playing. (And that was on a weeknight.) If you want to get a seat at the weekend, you’re best advised to arrive early and even then not to be choosy – at 5.30 last Saturday, drinking alone, I shared a table with six other people. It has a very regular core clientele and a very, very regular inner core – there are about a dozen people I expect to see in there most Saturdays, and two or three I’m not surprised to see in there any day of the week. With the Marble connection you might think the pub had potential as an ale boutique, like the new place on Thomas St, but the regulars at the Beerhouse aren’t beer connoisseurs, by and large; there are people who go there week in, week out and drink nothing but bottled cider with ice in. The pub’s more or less resisted the progressive embourgeoisement of the area – the drinks aren’t cheap and neither are the Kettle Chips, but you will hear local accents in there. (In fact you’ll feel a bit of a twit for ever imagining you weren’t going to hear local accents – but compare local 3.) I won’t say I’ve never seen trouble in there, but I can only think of one occasion off the top of my head – and I’ve been drinking there for something in the region of 20 years since it opened in 1999 (it just feels like it’s been there forever). Small update Just went past there, getting on for closing time on a Wednesday night. About 30 in. I think there’s a bit of tumbleweed during weekday afternoons, but as far as the night-time economy is concerned I think they’ve cracked it. Overall verdict: they’re doing it right. (Whether ‘they’ refers to the pub or the brewery is another matter!) Supplementary verdict: what they’re doing right is attracting and retaining a core of regulars, year in and year out; get that right and you’ve got a functioning pub, which will pull in the punters on the big nights at the weekend more or less of its own accord. ‘Mid-Atlantic’ – Britain’s new favourite beer or a passing fad? There was an interesting article by Gazza Prescott in the July 2010 Opening Times, called “Mid-Atlantic: the new ‘Best of British’?”; it’s a slightly shortened version of a similarly-titled post on Gazza’s site. Gazza’s argument goes something like this. There’s a distinctive beer style, which Gazza labels “mid-Atlantic”; it’s characterised by the use of lots of hops and the palest possible malt, to give an end result which is clear and pale yellow to look at, light in mouthfeel and very, very hoppy. Gazza traces the ancestry of this style from Exmoor Gold and Summer Lightning, through experiments by Rooster’s and Brendan Dobbin’s West Coast brewery, to today’s Pictish, Phoenix and Marble brews (“brewing of the new style around Manchester continued apace”). The growing availability of new varieties of hop, particularly from New Zealand, has fed into the growth of this style. Pale’n’hoppy beers are slowly taking over the beer culture of the UK … in the majority of specialist cask pubs nowadays, it’s common for most – if not all – of the pumps to be pouring beers of this style … this golden revolution is here and, on what I’ve seen atop bars and heard from brewers, it’s only going to keep growing. “Mid-Atlantic” combines the UK’s growing love of extremely pale beer with the American ethic of large-scale hopping and, in doing so, has created a style of beer which is easy to drink, full of hop flavour, uncluttered by dark malts and – importantly in these image-obsessed times – a delight to behold atop a bar. It’s becoming extremely popular in the UK at the expense of old-fashioned “brown bitter” … we can legitimately claim it to be a new style of beer, one we have invented, and one of which we should be justifiably proud. So, long live “Mid-Atlantic” pale ales… the UK’s new favourite beer style! I’m particularly struck by the idea that a pale yellow pint is intrinsically more attractive than a nut-brown one, irrespective of which you prefer to drink; it’s not a thought that’s ever crossed my mind before. I came to Manchester in my early twenties, in 1982. In the previous few years I’d drunk and enjoyed beer in London, East Anglia, Cumbria, Scotland and Wales. Those beers were very different – you’d never mistake Buckley’s for Young’s, or Dryburgh’s for Tolly Cobbold – but two things they all had in common: they were brown and they were malty. In Manchester things were different. The pride of the city was the yellow, hoppy Boddington’s Best; my local served the yellow, hoppy Hyde’s Anvil. I tried seeking out Robinson’s pubs, I tried switching to mild, but I soon realised I was fighting a losing battle: I was going to have to learn to like the Manchester pale style. It’s taken a while, but I’ve just about managed it. So I agree with Gazza Prescott on two things: there are a lot of these beers around at the moment, and some of them are very good. But I don’t believe this style is anywhere near as new as Gazza suggests, and I don’t believe it’s “taking over the beer culture of the UK”. Without looking particularly far afield, I’ve drunk big malty ales in 2010 from Allgates, Conwy, Dunham Massey, Moorhouse, Robinson’s, Rooster, Titanic… the list goes on. And surely this is how it should be – the strength of British beer is its diversity. Gazza’s “Mid-Atlantic” (I prefer “Manchester Pale”) isn’t a “golden revolution”; it’s just one style among many, one that happens to be popular this year. Done well (Pictish) it’s very nice indeed; pushed to extremes (Marble) it’s interesting at worst, stunning at best; done badly (no names) it’s bland as Budweiser. Hops have their place, but so does malt; brewers who forget this fact, in pursuit of the taste of 2010, could end up taking British beer up a flowery, lemony, smoky dead end. In south London, where I learned to drink, the bitter is generally tawny and malty. In south Wales and East Anglia, the next two areas where I tried the beer, the bitter is usually both malty and tawny. The types of bitter native to Scotland, Cornwall and Yorkshire, in my experience, have similar characteristics. There are variations – Cambridge beer is flat and tannic; a lot of Scottish beer tastes as if a bag of toffees has been dissolved in it (which in a sense it has); and South Walian beer is the best in the world bar none. [Damn, but I miss Buckley’s bitter.] But they’re variations within a shared style: in most parts of the country, if you order the local bitter you can safely expect something T and M.
Manchester is an exception. At least since the heyday of Boddington’s, there’s been a distinct local style of ale: pale and hoppy, with variations ranging from light-but-sour through cyanide-with-a-hint-of-malt to just-plain-undrinkably-bitter. I am not, as you may have gathered, a fan of this style – but the brewery which owns one of my two main locals [viz. the Marble] is very big on it. They brought on a seasonal ale in summer (when, to be fair, pale and hoppy styles do go down well) [the original (2005) Summer Marble]; I tried it once and seriously considered leaving the pint unfinished. It was the bitterest thing I’ve ever tasted, clove oil not excepted. The brewery does three or four different bitters, but they’re all pale and hoppy; most of the time the guest beers are pale and hoppy too. There’s a definite demand there, too. You can tell by the way the regulars’ favourite guests keep coming back – and the way their names keep including words like ‘white’ or ‘golden’. I’m in a minority on the tawny-and-malty front. A couple of years ago I had two pints of a guest mild they had on, and the barman asked me when I wanted to have the other 62. It’s probably also fair to say that these beers are the beer world’s equivalent of highly-peated malt whiskies such as Laphroiag and Talisker – very well-respected, but too much biased towards one extreme end of the flavour spectrum to appeal to many people as a regular tipple. You might well enjoy one or two during an evening’s sampling of a variety of beers, but few would want to drink them all night. That’s about right. I’m baffled by Gazza’s repeated assertion that these beers are outstandingly ‘drinkable’ or ‘easy to drink’. Most Marble beers, in my experience, have a full-on front-of-mouth attack combining bitterness with hop aroma. Sometimes they’re brilliant beers, but they’re certainly not easy drinking bitters; sometimes, when a brew is particularly hoppy or has a particularly strong nose, I’ve found it a challenge to get through a whole pint (especially when they were using that particular hop variety which smells of stale beer and vomit – or is that just me?). The malt is here to give body, alcohol and a suggestion of flavour and not to balance the hops; if you have balance then there’s something wrong! I like a lot more malt in my beer than Gazza, but I also like the sense that the different flavours are in balance. I think great beers almost invariably give that impression of balance, of no one flavour swamping the others; this is as true of Summer Lightning as it is of Old Peculier. What Gazza’s presenting is not so much a “golden revolution”, more a Hopheads’ Manifesto.